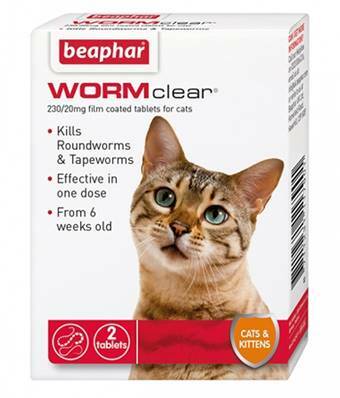 Beaphar WORMclear for Cats is for the treatment of mixed infections of gastrointestinal worms (roundworms and tapeworms) in cats. Given a meaty flavour to make it easier to administer, the tablets should be given directly to the cat, but can be hidden in food if necessary. They are suitable for cats and kittens from 6 weeks of age and over 1kg in weight, and effective in one simple dose. Kittens should be treated every 14 days until 2-3 weeks after weaning. Not suitable for pregnant cats. Does what it says on the box. Well worth tge purchase. Some orher brands havnt worked as well.